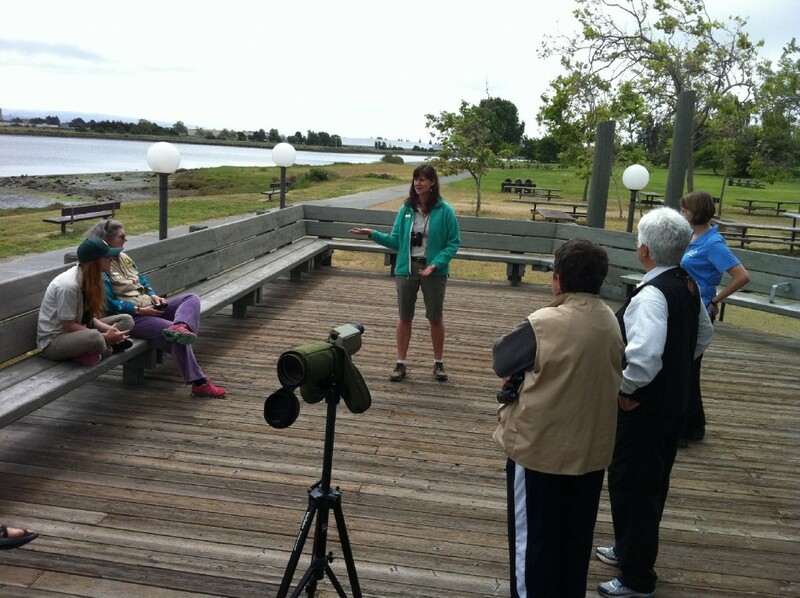 Our merry group of bird watchers gathered in the early morning, binoculars and bird books in hand, to explore the habitats along San Francisco Bay at Crown Beach. The beginning of May is a wonderful time to go bird watching with lingering winter birds and the arrival of neotropical migrants – birds that flew south for the winter and have returned to the Bay Area for summer – and local species all in the same area for a brief time. We checked three habitats over the course of our walk: a rocky shoreline, a brackish water pond and the mudflats. The rocky shoreline was much quieter than a month ago, with most of the shorebirds departed for their nesting grounds to the far north. A black oystercatcher with its impressive thick orange beak and jet-black body put in an appearance along with a spotted sandpiper. The oystercatcher stays in the same area year round with a strong, monogamous pair bond and often nests in the same place year after year. The spotted sandpiper is unusual in the shorebird world for its polyandry – females choose and defend territory and compete for multiple males who will then incubate and raise the chicks alone. Their nesting grounds are to the north and east of the Bay Area mostly in mountains near lakes and streams. The shoreline resounded with the raucous calls of Forster’s terns and a couple of California least terns. These two species, along with the larger Caspian tern, all nest in colonies primarily on islands in the bay. There’s safety in numbers, with flocks of adults ready to defend their eggs and chicks from predators such as gulls and raptors. The least terns, an endangered species, have their largest, northern-most nesting colony at the north end of Alameda behind locked gates on the former Naval Air Station’s runway. There’s another colony of least terns in Hayward, on East Bay Regional Parks land, that’s monitored by our Stewardship department and a dedicated group of volunteers. At the pond, bird life abounded with two new sets of mallard ducklings paddling close to their parents and red-winged blackbirds building nests in the thick cattails. 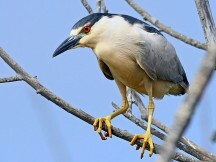 Skulking around the edges of the ponds, two magnificent Black-crowned Night-herons were actively hunting the ducklings, though we didn’t observe any success that morning. Swimming with the mallards were two ducks that provided some identification fun as we narrowed them down to the species, Gadwall. As we wound up our walk for the morning, with chestnut-backed chickadees and a red-breasted nuthatch searching the branches of a failing Monterey pine near the shoreline, we found a few shorebirds working the mudflats. With the tide receding, they were feeding, packing on a few more ounces before their nighttime flight north to their breeding grounds. The small flock contained dunlin in their fancy breeding plumage with black belly patches and rufous backs, Western sandpipers and sanderlings. They’ll all be winging away soon for the summer to return again in August. 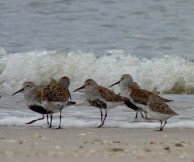 One of the amazing things about these shorebirds is that, for many species, the adults return before the fledged chicks. The chicks are left on the nesting grounds to keep feeding and fly on their own to winter grounds they’ve never been to before, sometimes thousands of miles away. San Francisco Bay has international significance as a habitat for shorebird survival with designation as a site of hemispheric importance, along with identification as a RAMSAR site in 2013. We’re fortunate to have it as our “backyard.” I hope you’ll get out and explore soon so you can appreciate our amazing, cosmopolitan yet species-rich area. Check EBRPD’s website or the local Audubon Society to find a birding group to join, or just scan your local park or backyard to meet your wild feathered neighbors.